Looking back on my childhood, the summer vacations to the amusement parks and over-the-top Christmas celebrations do stand out in my mind, but the grandiose doesn’t take up the biggest places in my heart. It was small things – fishing at the lake on a hot summer’s day, playing Scrabble at the table, gathering over mashed potatoes and baked chicken – that made me feel connected. It was the ordinary regular occurrences that made us feel like family. Now I’m raising two children of my own. When I feel like I need to throw a Pinterest-worthy birthday party or guilt arises because I haven’t yet taken them to Disneyland, I remind myself that it’s the everyday habits I keep that they will hold most dear. It’s during the moments when I put aside busyness to be present and attuned to the people in front of me – to laugh, to listen, to love – that the messages that matter reach their hearts. You are valued. You are loved. You belong here. Mornings can be a real hassle. Trying to get everyone up and out the door on time is often a stressful time for families. Our adult minds are focused on the dozens of things we must accomplish in the next 12 hours, and our children are often tired, grumpy, or preoccupied with their own thoughts on the day ahead. Taking two or three minutes of the morning to focus on our child’s face and say something positive can really have a big impact. “Good morning, my love! Seeing your sweet face makes me happy” is a thoughtful way to greet a child into their day. I think “Triple A to start the day.” That stands for attention, affection, and affirmation. Aim to give them your full attention for at least a couple of minutes, offer a hug or rub on the head, and say something positive about them. Making this a daily habit starts each day off on the right foot. Do the children get home from school and scatter in every direction? Mine tend to do that. Even if you homeschool or your children are still very young, creating an afternoon or after school gathering provides another connection point in your day. Some ideas for this gathering include tea time, a spread of fruits with dip or cheese and crackers, a round of Uno, or reading aloud a chapter from a great book. Again, this is undistracted time spent with your loved ones and it only takes a few minutes of the afternoon. This can easily be adjusted to an after-dinner or before-bath gathering. The time on the clock is not important. It’s the time spent that matters. When my children were very little and my husband worked odd shifts, we never ate together. I would snack through the day, my kids would eat dinner in the playroom, and my husband just ate whenever he got home. So, I certainly understand that dinner at the table every single night is not suitable for all families. Perhaps an early morning breakfast together is more doable, or even a late evening dessert-only meeting in the kitchen works best. Some researchers suggest that the benefits from family meals are many, including healthier eating for kids, improved psychological well-being, greater academic achievement, and even less delinquency! (Source) We don’t need studies to tell us that gathering together for conversation and good food is meaningful though, do we? 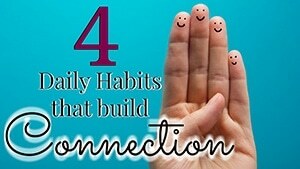 If it’s not already on your priority list, it’s a great time to start this connection-building habit. I know that by this time of night, most of us are ready to be done with the day. We might even develop a tendency to rush through the bedtime routine to get to that ever so elusive “me time.” Truly though, these few minutes spent connecting heart-to-heart with my kids is worth pushing back my episode of Pretty Little Liars just a little longer. 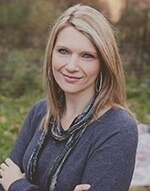 Rebecca Eanes is the creator of www.positive-parents.org and author of The Newbie’s Guide to Positive Parenting. In her new book, Positive Parenting: An Essential Guide, Rebecca shares her hard-won insights on giving up the conventional parenting paradigm to reconnect heart to heart with her children. Because parenting is about so much more than discipline, Rebecca hits on important topics less spoken about, making this more than a parenting book. It’s a book about building lasting family bonds and reclaiming joy in parenting.